Rebecca Lilly Brooks will serve as the next chair of the Indiana University Lilly Family School of Philanthropy’s Board of Visitors, Amir Pasic, Ph.D., the Eugene R. Tempel Dean of the school, announced. “Becky brings a great depth of expertise in many different aspects of philanthropy and the nonprofit sector. I am looking forward to her leadership and her anticipated dynamic tenure as she leads our distinguished board of volunteer champions,” Pasic said. A private wealth advisor in the financial service industry, Brooks has served on the school’s board since 2015. Her term as chair will begin July 1, 2017. “Philanthropy is evolving rapidly, and the school plays a unique, positive role in helping all who are involved in philanthropy understand, anticipate and adapt to those changes. I’m delighted to serve as the chair of the board of visitors, and I look forward to contributing to the school’s growth and leadership in the field,” Brooks said. Brooks will succeed Melynne Klaus, M.A. ‘03, director of the Christel DeHaan Family Foundation, who has chaired the board since 2013 and has been a member since 2010. Brooks has extensive expertise and experience in high net worth client relationship management and investment analysis in multiple industries. 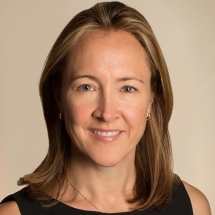 Prior to her current role with Morgan Stanley, she held positions at Goldman Sachs; Puig USA, a privately owned luxury goods company; IBM Industry Consulting; Eli Lilly & Company; Sotheby’s; and The Smithsonian Institution. She earned her M.B.A. from Yale University and her B.A. from Tufts University. In addition to her professional work in philanthropy, Brooks is an active volunteer in her community and with other nonprofit organizations. She currently serves on the board of the New York City Alumni Chapter of the Yale School of Management and on the board of trustees of Heritage Museums & Gardens in Sandwich, Mass. She previously founded a branch of a youth service nonprofit organization, served as a board member for a private school, and coached a competitive youth sports team. The school’s board comprises national corporate and foundation leaders, philanthropists, community volunteers and nonprofit executives. Billie Dragoo, CEO, RepuCare Inc.
Amanda Kamman, Vice President, Development, Project Lead The Way, Inc.
Craig Leach, Chairman and CEO, Collegium Holdings, Inc.
Jerre Stead*, Chairman and CEO, IHS Markit Inc. Ace Yakey, Vice President for Community Development, Lilly Endowment Inc.